Kashmir is not only known for its fascinating landscape view or its enticing weather. Festivals are an integral part of the people of Kashmir. Apart from the religious festivities the region also offers unique festivals for the tourists visiting this place. The lines below describe the snow festival which attracts tourists to visit this place. Gulmarg is an amazing place to visit during winter with snow covering the entire place. The best way to enjoy this divine experience is by being a part of the ‘Snow Festival’ that is held in Gulmarg and organized by Jammu and Kashmir Tourism department. The official starting time of this festival is in the month of December. Several winter sports are lined up in this festival including skiing, rugby, snow baseball, snow cycling, night skiing and ice skating. The Jammu & Kashmir Tourism Department makes all the arrangements so that it can encourage the tourism industry of Kashmir. It also makes arrangements for ‘snow fiesta’ in Pahalgam and will also be constructing the basic communications at the brand new tourist attractions including Yusmarg, Sonamarg, Bangus Valley and Dodhpathri. The department has already made all the developments for this cause. Gulmarg is also well-known for its world famous ‘ski resort’ and has grown in popularity as a destination for holidaying. The most popular tourist spot in Kashmir, Gulmarg, is also referred to as the ‘Queen of the Hills’ and is the ideal place for participating in winter sporting activities. The ‘Kashmir Snow Festival’ in Gulmarg is welcomed and enjoyed with full enthusiasm. Various snow games including rugby, cycling, skiing, snowboarding and ice skating are all arranged by the Kashmir Tourism Department with various people and teams participating in the games. 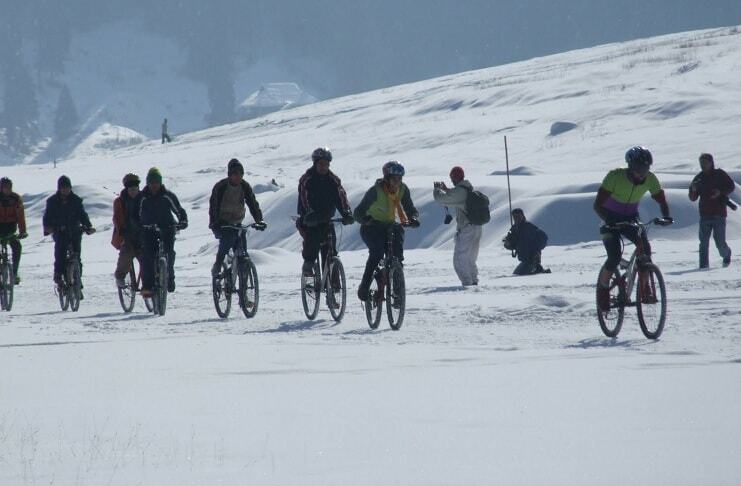 The main attraction of this 3-day festival held in Gulmarg is snow cycling. The various mountain riders participate in this snow cycling event and the spectators cheer up the participants all the way through. This particular sport is one which requires courage on part of the participant as the path is filled with thrill and risks. Majority of the locals and participants enjoy this game the most among the others organized during this festivity. Snow rugby is another major tourist attraction as it involves a lot of action and adrenalin rush. The snow baseball is one of the newest additions made by the Tourism Department to this festival which is intriguing to the sports lovers and has been well-accepted by the participants. The skiing and skating championships organized by the J&K Tourism Department lure the local folks as well as visitors for participation. Enthusiastic skiers are provided with skiing equipments at considerably cheaper rates by the organizers. Several cultural group performances are also arranged for during this festival with locals participating in these programs. The ‘Snow Festival’ takes places in the month of January every year when the temperature is at its lowest in this region and none of the areas in Gulmarg are spared of snowfall. The temperature being very low may adversely affect the health of the visitors which is why it is important for you to take all the precautionary measures before you make plans to visit this region of Kashmir. However, do not forget to enjoy yourselves while trying to be too protective. The Tourism Department of Jammu and Kashmir does not charge any ‘entry fee’ or any r community and/or religious restriction for participation in this festival. This is done in order to encourage more and more people to visit this place which in turn boosts the tourism industry. The ‘Snow Festival’ has played a crucial role in improving tourism in Gulmarg region of Kashmir. It is one the most prominent additional source of attractions to make the visitors spend some more time in Kashmir.